The cracking took a couple of minutes to reach it's full effect and the key I think is to apply it as the base colour is drying. You can see that the ring finger and pinky of my right hand directly above didn't really "crack" much as I applied it quite some time after the base polish was dry. 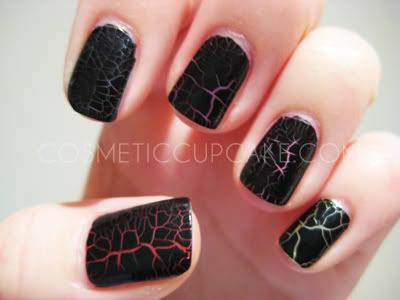 I think this polish is so COOL! 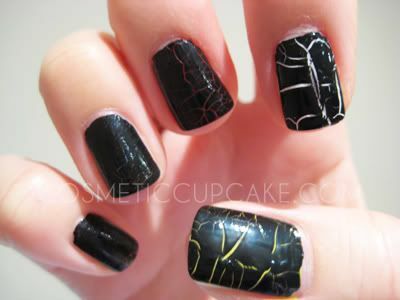 It's a quick and simple way of doing nail art however it may not be to everyone's liking. I wore it to work yesterday and 2 colleagues and at least 2 patients said to me I needed to change my polish because it was cracking! LOL. I had to patiently explain that it was designed like that. 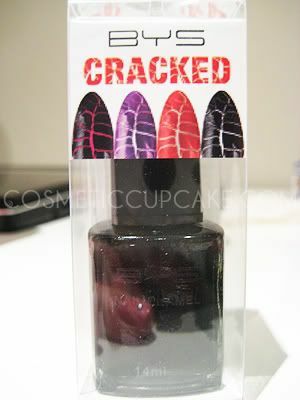 :) Nice blog, love the nail polishes! I will be checking out their website. Thanx! Thankyou for stopping by and following! wauw cool...where do you buy?